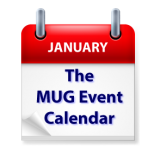 This week’s MUG Event Calendar features a presentation on iCloud at a German group, a social media workshop at a Maryland group, a discussion of Maps in Michigan, and a community computer and electronics swap meet conducted by a Texas group. Maine Macintosh Owners & Operators Society – 17 for ’17 – 17 Resolutions to Make 2017 Your Best Apple Year Ever! Tucson Macintosh Users Group – Election of Officers; Tech Update; Default Folder X; Apple Security Update; "Why Apple Watch?"